Ivy Bloodgood doesn’t have to worry about her mother anymore. Her mother is dead now, the victim of her own mental illness. Ivy, still only 16, goes to live with her uncle on an almost-deserted island in Maine. “Almost” because there is one other family living there. The Ramseys. But Ivy doesn’t listen to her. She doesn’t listen to anybody. She’s never had to. Well, except for her mother, but she’s gone now. Ivy takes the first opportunity to explore the island and finds herself face-to-face with one of the very Ramseys she was told to avoid: Doyle, her age, whom she’d seen from the boat as she rode to the island earlier that day. Ivy is torn between the two families. Her uncle claims to have her wellness at heart, while Doyle warns her to run away as fast as she can. She doesn’t know who to believe—she’s known these people for mere days. The nightmares she’s having throw her into even deeper confusion. Why is she dreaming of a young girl? Why does she see herself covered in blood, only to wake up in her bed, as if nothing happened? Ivy wants only to make it to her 18th birthday, so she can begin life on her own. Somewhere far away. San Francisco. But she has to live that long to make it happen. 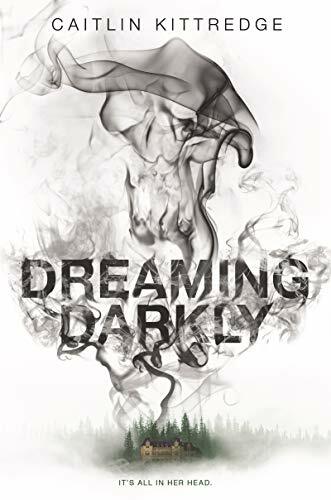 Dreaming Darkly is eerie and tense, with an underlying dread. Ivy is likeable, although flawed, and her plight is both frightening and thrilling. This book will appeal to teens—or adults—who like dark murder mysteries with just a touch of supernatural terror. Horror readers will find it entertaining, as well as anyone who wishes for a tale that makes them feel as if someone is watching over their shoulder. . . .